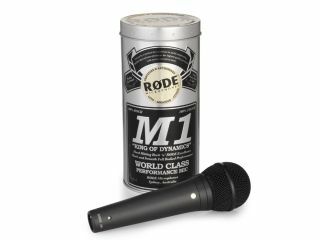 The Rode M1: if Chuck Norris wanted a mic, he'd buy this one. Rock 'n' roll singers are renowned for abusing their microphones - and not just by spouting nonsensical lyrics into them. However, Rode reckons it's come up with a model that can handle anything that's thrown at it. The M1 comes with a solid die-cast body and sturdy dynamic capsule, and is said to be suitable for "late nights, crowded stages and long tours". Rode clearly believes that this is a mic that's built to last, and is prepared to put its money where its mouth is by offering an ultra-extended guarantee. "Rode has so much confidence in the M1's rock credentials that it's prepared to back it with a lifetime warranty" said Damien Wilson, Sales & Marketing Director at Rode. "You can be sure that in choosing the Rode M1 you are investing in a microphone that not only looks and sounds rock n roll, but will be a part of your kit for a long time to come." So, the challenge is set: break the M1 if you can. We're not sure when it'll be available, but it looks like the US retail price will be $199.